Back in 2012, an LP from a band called Venomous Maximus came across my desk, containing a haunting occult doom/NWOBHM hybrid with a particularly good track called Give Up the Witch. For some reason I never got around to reviewing it, even though it popped up in my listening queue as if to remind me. Fast-forward to 2017, and the Texans have released a new album, No Warning, even more grandiose and menacing than the last. Vocalist Gregg Higgins makes the band's sound instantly memorable. Half spoken, half belted out in a funereal tone, his lyrics embody a bombastic gothic solemnity. The closest comparison I can think of is the ones on Coven's Worship New Gods -- both albums have a noticable punk influence --, but this is darker and more emotional. There's still a doom influence, but a lot of the songs are now straying pretty far from that mold in directions of their own. The guitars, at the front of the mix, supply a noisy and satisfyingly heavy parade of riffs, but in fact the whole band is tight and precise on every track, no matter how chaotic the mix of funeral-march plodding and Higgins' idiosyncratic vocal delivery. Apparently people have been asking for a track as good as Give Up the Witch was, and Venomous Maximus couldn't resist on this one -- accordingly, we get Return of the Witch, with a similar beat and melody to the original, though slightly slower on the beat. Straightforward, riff-driven heavy metal is available too here. No Warning yields chugging with less wailing in the vocals, a welcome change; there are only so many witch-burning mobs the listener can march with before their joys start to pall, after all. An equally interesting one is Blood for Blood, a song reminding me a little of AC/DC's Hells Bells on the chorus. The band closes out, after so much NWOBHM influence, with Sea of Sleep, a ten-minute traditional doom piece that drags things back to a crawl; even there, there's a swinging rhythm in the middle, something the band has some difficulty getting enough of. 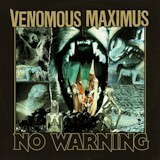 Venomous Maximus's unusual sound gets a small update here on No Warning, but no major changes -- nor does it need them. A band that causes you to instantly recognize their unique sound the next time you hear one of their songs is no longer as common as it once was, but Venomous Maximus is one of these.